CLEVELAND – Five years ago, sheet metal locals in Ohio set a course to educate fire marshals and building inspectors in local municipalities on the importance of fire and smoke damper installation, inspection and maintenance by qualified, certified technicians. In June 2013, the first ordinance, requiring technicians and contractors to be certified by the International Certification Board (ICB), was adopted in Garfield Heights. Since then, eight municipalities in the state have adopted similar ordinances. Ordinances in Lake County, Lucas County (containing Toledo) and the city of Columbus were all adopted in 2015. The city of Cleveland ordinance, passed in May, also requires the building owner to repair or replace faulty dampers within 60 days of inspection. Smoke and fire dampers help first responders do their jobs by containing smoke in affected areas and keeping pathways clear in order for them to rescue occupants and fight the fire. It’s estimated that 50 to 70 percent of smoke and fire dampers in buildings may not work correctly because they haven’t been properly serviced or inspected. From the time the ordinance passed, dampers in buildings, including many utilized by the City of Cleveland, will be inspected within 18 months. Cleveland is part of Cuyahoga County, which adopted the ordinance in 2013 for county-owned buildings. The recent ordinance was passed by the Cleveland City Council for city-owned buildings. Two years into inspections in Cuyahoga County, the county brought four sheet metal workers on staff to complete the inspections. Repairs and replacements remain with signatory contractors. 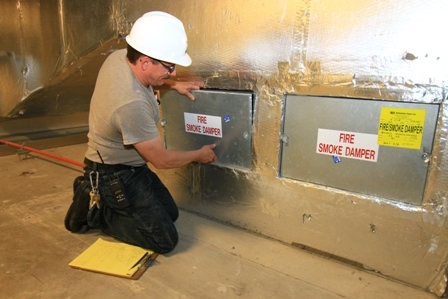 This year, the county appropriated $1.4 million to inspect and repair fire and smoke dampers. All the adopted ordinances began with fire damper and smoke damper demonstrations to fire officials as well as elected officials. The demonstration illustrates what happens when equipment isn’t working properly – smoke backs up into a room, causing a higher probability occupants will suffer from smoke inhalation. The visual presentation held at training centers across Ohio – along with additional information – has an impact. “Once they see the demonstration actually happen – how if one damper isn’t working properly and how the smoke backs up into the ductwork system – they get it. Once they know the testing and inspection information has been in the NFPA (National Fire Protection Association) standards for decades, the light bulb goes off. Once they understand, they’re on board with you. Because many municipalities across the state have adopted similar ordinances, the work is spread out so companies of all sizes with fire life safety departments can benefit, said Mike Coleman, business manager for Local No. 33 near Cleveland. Although Sickle has a small fire life safety department, the work keeps his employees busy. Having certified workers allows him to bid damper inspection jobs and serves as an incentive to other employees who have yet to be certified. If they take the class and complete the certification, they can get in on the work, too. With two certified supervisors and six employees in the fire life safety department at T.H. Martin, Inc., the company generated 2,800 fire life safety hours in 2015 – 3 percent of the total 100,000 total sheet metal hours. To Tom Martin, president of the company, the opportunities allowed by the ordinance don’t stop at fire life safety. If dampers are proven faulty and repairs and replacements are needed, and if a contractor already has a building owner’s trust, the relationship turns into the work. HVAC Fire Life Safety training for journeymen, contractors and apprentices to secure certifications takes place at the local training centers. There, sheet metal workers and contractors also focus on educating to main sectors: the fire officials, fire departments, inspectors, facility managers, engineers and government entities that have yet to develop fire life safety services.